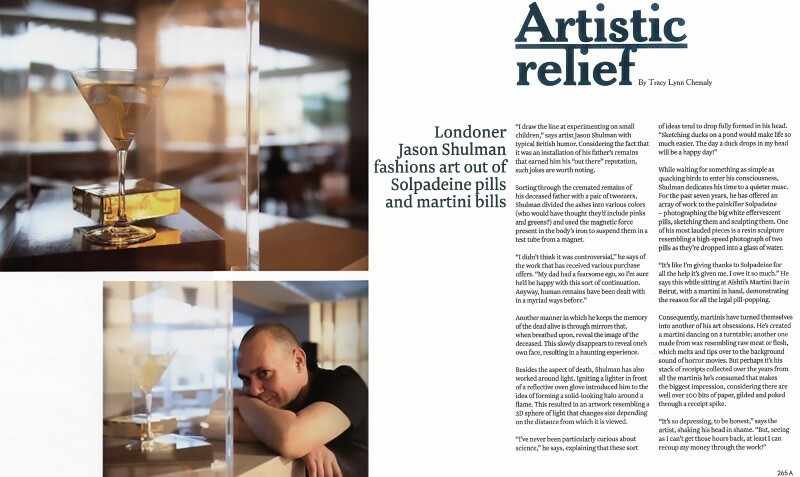 Londoner Jason Shulman fashions art out of Solpadeine pills and martini bills. "I draw the line at experimenting on small children," says artist Jason Shulman with typical British humour. Considering the fact that it was an installation of his father's remains that earned him his "out there" reputation, such jokes are worth noting. Sorting through the cremated remains of his deceased father with a pair of tweezers, Shulman divided the ashes into various colors (who would have thought they'd include pinks and greens?) and used the magnetic force present in the body's iron to suspend them in a test tube from a magnet.